The United States Senate is one of the two chambers of the United States Congress, the other being the House of Representatives. In the Senate, each state is equally represented by two members; as a result, the total membership of the body is currently 100. Senators serve for six-year terms that are staggered so elections are held for approximately one-third of the seats (a " class") every second year. The Vice President of the United States is the President of the Senate and serves as its presiding officer, but is not a Senator and does not vote except to break ties. The Vice President rarely acts as President of the Senate unless casting a tie-breaking vote or during ceremonial occasions, so the duty of presiding usually falls to the President Pro Tempore, customarily the most senior senator of the majority party. Most often, the President Pro Tempore will designate a member from his or her party to serve as presiding officer for the day. The Senate is regarded as a more deliberative body than the House of Representatives; the Senate is smaller and its members serve longer terms, allowing for a more collegial and less partisan atmosphere that is somewhat more insulated from public opinion than the House. The Senate has several exclusive powers enumerated in Article One of the Constitution not granted to the House; most significantly, the President cannot ratify treaties or make important appointments without the advice and consent of the Senate. The Framers of the Constitution created a bicameral Congress out of a desire to have two houses to check each other. One house was intended to be a "people's house" that would be very sensitive to public opinion. The other house was intended to be a more reserved, more deliberate forum of elite wisdom that represented the state legislatures. The Constitution provides that the approval of both chambers is necessary for the passage of legislation. The exclusive powers enumerated to the Senate in the Constitution are regarded as more important than those exclusively enumerated to the House. As a result, the responsibilities of the Senate (the " upper house") are more extensive than those of the House of Representatives (the " lower house"). The partisan makeup of the Senate during the 110th Congress, by state. 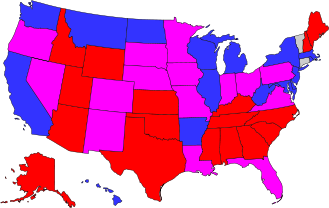 Red states are represented by two Republican Senators; blue states, by two Democratic Senators; magenta states, by one Senator from each party; and grey states, by an Independent and a Democrat. Connecticut is colored blue, as incumbent Senator Joseph Lieberman, while re-elected by running independently from his affiliated party in 2006, remained a Democrat. Article One of the Constitution states that each state may elect two senators. The Constitution further stipulates that no constitutional amendment may deprive a state of its equal suffrage in the Senate without the consent of the state concerned. The District of Columbia and territories are not entitled to any representation. As there are presently 50 states, the Senate has 100 members. The senator from each state with the longer tenure is known as the " Senior Senator," and their counterpart is the "junior senator"; this convention, however, does not have any official significance. Senators serve for terms of six years each; the terms are staggered so that approximately one-third of the Senate seats are up for election every two years. The staggering of the terms is arranged such that both seats from a given state are never contested in the same general election. Senate elections are held on the first Tuesday after the first Monday in November, Election Day, and coincide with elections for the House of Representatives. Each senator is elected by his or her state as a whole. Generally, the Republican and Democratic parties choose their candidates in primary elections, which are typically held several months before the general elections. Ballot access rules for independent and third party candidates vary from state to state. For the general election, almost all states use the first-past-the-post system, under which the candidate with a plurality of votes (not necessarily an absolute majority) wins. Exceptions include Georgia and Louisiana, which use runoff voting. Once elected, a senator continues to serve until the expiry of his or her term, death, or resignation. Furthermore, the Constitution permits the Senate to expel any member; with a two-thirds majority vote required to do so. 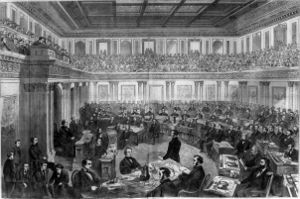 Fifteen members have been expelled in the history of the Senate; 14 of them were removed in 1861 and 1862 for supporting the Confederate secession, which led to the American Civil War. No senator has been expelled since; however, many have chosen to resign when faced with expulsion proceedings (most recently, Bob Packwood in 1995). The Senate has also passed several resolutions censuring members; censure requires only a simple majority and does not remove a senator from office. The Seventeenth Amendment provides that vacancies in the Senate, however they arise, may be filled by special elections. A special election for a Senate seat need not be held immediately after the vacancy arises; instead, it is typically conducted at the same time as the next biennial congressional election. If a special election for one seat happens to coincide with a general election for the state's other seat, then the two elections are not combined, but are instead contested separately. A senator elected in a special election serves until the original six-year term expires, and not for a full term of his own. Furthermore, the Seventeenth Amendment provides that any state legislature may empower the Governor to temporarily fill vacancies. The interim appointee remains in office until the special election can be held. All states, with the sole exception of Arizona, have passed laws authorizing the Governor to make temporary appointments. Senators are entitled to prefix " The Honorable" to their names. The annual salary of each senator, as of 2006, was $165,200; the President pro tempore and party leaders receive larger amounts. Analysis of financial disclosure forms by CNN in June 2003 revealed that at least 40 of the then senators were millionaires. In general, senators are regarded as more important political figures than members of the House of Representatives because there are fewer of them, and because they serve for longer terms, represent larger constituencies (except for House at-large districts, which also comprise entire states), sit on more committees, and have more staffers. The prestige commonly associated with the Senate is reflected by the background of presidents and presidential candidates; far more sitting senators have been nominees for the presidency than sitting representatives. Article I, Section 3 of the Constitution sets forth three qualifications for senators: each senator must be at least 30 years old, must have been a citizen of the United States for at least the past nine years, and must be (at the time of the election) an inhabitant of the state he or she seeks to represent. The age and citizenship qualifications for senators are more stringent than those for representatives. In Federalist No. 62, James Madison justified this arrangement by arguing that the "senatorial trust" called for a "greater extent of information and stability of character." Under the Constitution, the Senate (not the courts) is empowered to judge if an individual is qualified to serve. During its early years, however, the Senate did not closely scrutinize the qualifications of members. As a result, three individuals that were constitutionally disqualified due to age were admitted to the Senate: twenty-nine-year-old Henry Clay (1806), and twenty-eight-year-olds Armistead Mason (1816) and John Eaton (1818). Such an occurrence, however, has not been repeated since. In 1934, Rush Holt was elected to the Senate at the age of twenty-nine; he waited until he turned thirty to take the oath of office. Likewise, Joseph Biden was elected to the Senate shortly before his 30th birthday in 1972; he had passed his 30th birthday by the time the Senate conducted its swearing-in ceremony for that year's electees in January, 1973. The party with a majority of seats is known as the majority party; if two or more parties in opposition are tied, the Vice President's affiliation determines which party is the majority party. The next-largest party is known as the minority party. The President pro tempore, committee chairmen, and some other officials are generally from the majority party; they have counterparts (for instance, the "ranking members" of committees) in the minority party. Independents and members of third parties (so long as they do not caucus with or support either of the larger parties) are not considered in determining which is the majority party. The Constitution provides that the Vice President of the United States serves as the President of the Senate and holds a vote which can only be cast to break a tie. By convention, the Vice President presides over very few Senate debates, attending only on important ceremonial occasions (such as the swearing-in of new senators) or at times when his vote may be needed to break an equally divided tie vote. The Constitution also authorizes the Senate to elect a President pro tempore (Latin for "temporary president") to preside in the Vice President's absence; the most senior senator of the majority party is customarily chosen to serve in this position. The President pro tempore is currently Senator Ted Stevens (R) of Alaska, but when the 110th Congress convenes in January 2007, he will be replaced with Robert Byrd (D) of West Virginia. Like the Vice President, the President pro tempore does not normally preside over the Senate. Instead, he typically delegates the responsibility of presiding to junior senators of the majority party. Frequently, freshmen senators (newly elected members) are allowed to preside so that they may become accustomed to the rules and procedures of the body. The presiding officer sits in a chair in the front of the Senate chamber. The powers of the presiding officer are extremely limited; he primarily acts as the Senate's mouthpiece, performing duties such as announcing the results of votes. The Senate's presiding officer controls debates by calling on members to speak; the rules of the Senate, however, compel him to recognize the first senator who rises. The presiding officer may rule on any " point of order" (a senator's objection that a rule has been breached), but the decision is subject to appeal to the whole house. Thus, the powers of the presiding officer of the Senate are far less extensive than those of the Speaker of the House. Each party elects a senator to serve as floor leader, a position which entails acting as the party's chief spokesperson. The Senate Majority Leader is, furthermore, responsible for controlling the agenda of the Senate; for example, he schedules debates and votes. Each party also elects a whip to assist the leader. A whip works to ensure that his party's senators vote as the party leadership desires. The Senate is also served by several officials who are not members. The Senate's chief administrative officer is the Secretary of the Senate, who maintains public records, disburses salaries, monitors the acquisition of stationery and supplies, and oversees clerks. The Secretary is aided in his work by the Assistant Secretary of the Senate. Another official is the Sergeant-at-Arms, who, as the Senate's chief law enforcement officer, maintains order and security on the Senate premises. The Capitol Police handles routine police work, with the Sergeant-at-Arms primarily responsible for general oversight. Other employees include the Chaplain and Pages. Like the House of Representatives, the Senate meets in the United States Capitol in Washington, D.C. At one end of the Chamber of the Senate is a dais from which the Presiding Officer (the Vice President or the President pro Tempore) presides. The lower tier of the dais is used by clerks and other officials. One hundred desks are arranged in the Chamber in a semicircular pattern; the desks are divided by a wide central aisle. By tradition, Democrats sit on the right of the centre aisle, while Republicans sit on the left, as viewed from the presiding officer's chair. Each senator chooses a desk on the basis of seniority within his party; by custom, the leader of each party sits in the front row. Sittings are normally held on weekdays; meetings on Saturdays and Sundays are rare. Sittings of the Senate are generally open to the public and are broadcast live on television by C-SPAN 2. The Constitution provides that a majority of the Senate constitutes a quorum to do business. Under the rules and customs of the Senate, a quorum is always assumed to be present unless a quorum call explicitly demonstrates otherwise. Any senator may request a quorum call by "suggesting the absence of a quorum"; a clerk then calls the roll of the Senate and notes which members are present. In practice, senators almost always request quorum calls not to establish the presence of a quorum, but to temporarily delay proceedings. Such a delay may serve one of many purposes; often, it allows Senate leaders to negotiate compromises off the floor. Once the need for a delay has ended, any senator may request unanimous consent to rescind the Quorum Call. The filibuster is a tactic used to defeat bills and motions by prolonging debate indefinitely. A filibuster may entail long speeches, dilatory motions, and an extensive series of proposed amendments. The longest filibuster speech in the history of the Senate was delivered by Strom Thurmond, who spoke for over twenty-four hours in an unsuccessful attempt to block the passage of the Civil Rights Act of 1957. The Senate may end a filibuster by invoking cloture. In most cases, cloture requires the support of three-fifths of the Senate; however, if the matter before the Senate involves changing the rules of the body, a two-thirds majority is required. Cloture is invoked very rarely, particularly because bipartisan support is usually necessary to obtain the required supermajority. If the Senate does invoke cloture, debate does not end immediately; instead, further debate is limited to thirty additional hours unless increased by another three-fifths vote. When debate concludes, the motion in question is put to a vote. In many cases, the Senate votes by voice vote; the presiding officer puts the question, and Members respond either "Aye" (in favour of the motion) or "No" (against the motion). The presiding officer then announces the result of the voice vote. Any senator, however, may challenge the presiding officer's assessment and request a recorded vote. The request may be granted only if it is seconded by one-fifth of the senators present. In practice, however, senators second requests for recorded votes as a matter of courtesy. When a recorded vote is held, the clerk calls the roll of the Senate in alphabetical order; each senator responds when his or her name is called. Senators who miss the roll call may still cast a vote as long as the recorded vote remains open. The vote is closed at the discretion of the presiding officer, but must remain open for a minimum of 15 minutes. If the vote is tied, the Vice President, if present, is entitled to a tie-breaking vote. If the Vice President is not present, however, the motion fails. On occasion, the Senate may go into what is called a secret, or closed session. During a closed session, the chamber doors are closed, and the galleries are completely cleared of anyone not sworn to secrecy, not instructed in the rules of the closed session, or not essential to the session. Closed sessions are quite rare, and usually held only under very certain circumstances where the senate is discussing sensitive subject-matter such as information critical to national security, private communications from the President, or even to discuss Senate deliberations during impeachment trials. Any Senator may call for and force a closed session as long as the motion is seconded by at least one other member. Budget bills are governed under a special rule process called " Reconciliation" that disallows filibusters. Reconciliation was devised in 1974 but came into use in the early 1980s. 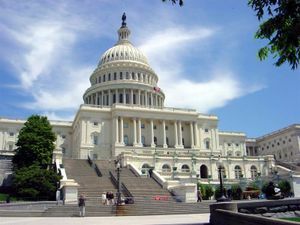 The Senate uses committees (as well as their subcommittees) for a variety of purposes, including the review of bills and the oversight of the executive branch. The appointment of committee members is formally made by the whole Senate, but the choice of members is actually made by the political parties. Generally, each party honours the preferences of individual senators, giving priority on the basis of seniority. Each party is allocated seats on committees in proportion to its overall strength. Most committee work is performed by sixteen standing committees, each of which has jurisdiction over a specific field such as Finance or Foreign Relations. Each standing committee may consider, amend, and report bills that fall under its jurisdiction. Furthermore, each standing committee considers presidential nominations to offices related to its jurisdiction. (For instance, the Judiciary Committee considers nominees for judgeships, and the Foreign Relations Committee considers nominees for positions in the Department of State.) Committees have extensive powers with regard to bills and nominees; they may block nominees and impede bills from reaching the floor of the Senate. Finally, standing committees also oversee the departments and agencies of the executive branch. In discharging their duties, standing committees have the power to hold hearings and to subpoena witnesses and evidence. Each Senate committee and subcommittee is led by a chairman (always a member of the majority party). Formerly, committee chairmanship was determined purely by seniority; as a result, several elderly senators continued to serve as chairmen despite severe physical infirmity or even senility. Now, committee chairmen are in theory elected, but in practice, seniority is very rarely bypassed. The chairman's powers are extensive; he controls the committee's agenda, and may prevent the committee from approving a bill or presidential nomination. Modern committee chairmen are typically not forceful in exerting their influence, although there have been some exceptions. The second-highest member, the spokesperson on the committee for the minority party, is known in most cases as the Ranking Member. In the Select Committee on Intelligence and the Select Committee on Ethics, however, the senior minority member is known as the Vice Chairman. [T]he Senate's right to amend [revenue bills] has been allowed the widest possible scope. The upper house may add to them what it pleases; may go altogether outside of their original provisions and tack to them entirely new features of legislation, altering not only the amounts but even the objects of expenditure, and making out of the materials sent them by the popular chamber measures of an almost totally new character. The approval of both the Senate and the House of Representatives is required for any bill, including a revenue bill, to become law. Both Houses must pass the exact same version of the bill; if there are differences, they may be resolved by a conference committee, which includes members of both bodies. The Constitution provides that the President can make certain appointments only with the advice and consent of the Senate. Officials whose appointments require the Senate's approval include members of the Cabinet, heads of federal executive agencies, ambassadors, Justices of the Supreme Court, and other federal judges. However, Congress may pass legislation to authorize the appointment of less important officials without the Senate's consent. 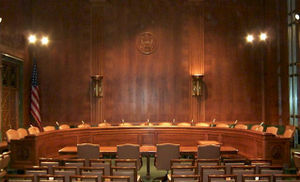 Typically, a nominee is first subject to a hearing before a Senate committee. Committees may block nominees, but do so relatively infrequently. Thereafter, the nomination is considered by the full Senate. In a majority of the cases, nominees are confirmed; rejections of Cabinet nominees are especially rare (there have been only nine nominees rejected outright in the history of the United States). The Senate has the power to try impeachments. Shown above is the impeachment trial of President Andrew Johnson. The Constitution empowers the House of Representatives to impeach federal officials for "Treason, Bribery, or other high Crimes and Misdemeanors" and empowers the Senate to try such impeachments. If the sitting President of the United States is being tried, the Chief Justice of the United States presides over the trial. During any impeachment trial, senators are constitutionally required to sit on oath or affirmation. Conviction requires a two-thirds majority of the senators present. A convicted official is automatically removed from office; in addition, the Senate may stipulate that the defendant be banned from holding office in the future. No further punishment is permitted during the impeachment proceedings; however, the party may face criminal penalties in a normal court of law. The Democratic Party is considered to hold a majority with 51 seats because the two independents, Bernie Sanders ( Vermont) and Joseph Lieberman ( Connecticut), have indicated that they will caucus with the Democrats. Independent 1 Caucuses with the Democrats. Independent 2 Bernie Sanders and Joe Lieberman have agreed to caucus with the Democrats. Joe Lieberman refuses to close the door on switching parties, potentially shifting the power back in the Senate to Republican. A similar situation happened in the Great Senate Deadlock of 1881. The Senate Republican and Democratic floor leaders are elected by the members of their party in the Senate at the beginning of each Congress. Historically, when there have been an equal number of Republicans and Democrats, the Vice President, as President of the Senate, is called upon to cast the tie breaking vote. For example, this occured frequently during the 107th Congress. *Senator James Jeffords of Vermont announced his switch from Republican to Independent status, effective June 6, 2001. Jeffords announced that he would caucus with the Democrats, giving the Democrats a one-seat margin (50-49), thus passing control of the Senate from the Republicans back to the Democrats.